Not really sure what I intend to accomplish with this post, but I’m feeling nostalgic, and I’d rather put off some homework a while longer, so it’s getting written. 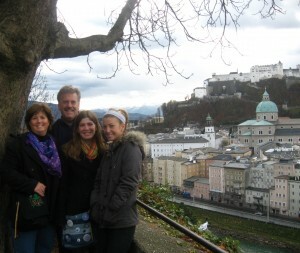 A year ago today us AIFS kids finally made it to Salzburg and started building our lives in our new city. From my vantage point today, it seems ridiculous that there was ever a time I wasn’t friends with the people I bonded with, that grocery shopping was difficult, that riding the bus was a challenge, or that going to O’Malley’s wasn’t just what everyone did almost every night. Yet there was that time, and I can remember distinctly looking up to the Salzburg fortress on our first walk into the city that jetlagged Sunday night of our arrival and wondering how anyone could ever feel at home in a city built around an ancient castle, a city so different from the circa-1980s suburbs so many of us grew up in. Now I know. You feel at home when you memorize the bus map and schedule. When you have close friends and can walk around town and run into people you know. When you have favorite foods, places, and traditions. It didn’t take as long as one would think, and it hasn’t faded much over the past couple of months. 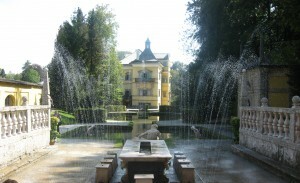 I still miss Salzburg everyday. I catch myself putting German radio on to fill the silence. I’m still hording a few bars of Milka chocolate and some bags of gummy bars. (For what occasion, I’m not sure) I have a slightly tattered Salzburg Red Bulls poster up on my wall. So, yes, I miss the place. But even more so I miss the people. I miss laughing until I cried over the silliest of things, and sharing the bizarre sense of achievement you get when you master even the smallest of tasks in a foreign country in a foreign language. I miss late night and early morning train/bus rides, and the sense that anything was possible because, no matter how insane the plans, someone was wiling to get on a train with you at 4 in the morning to god knows where. Would I go back tomorrow? I would, but I know it wouldn’t be the same as it was a year ago, and that would be enough to make me hesitate. Salzburg, as any city, has changed I’m sure since I left it in December, and I’ve changed as well. I’ve re acclimated to life in the states where stores and cars are bigger, kebabs are not nearly so popular, and some of my best friends are scattered across the country instead of nearby where I want them to be. 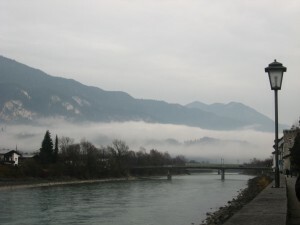 (Miss you guys terribly) But I know I’ll make it back to Salzburg day; I hope all of us will, together or separately. 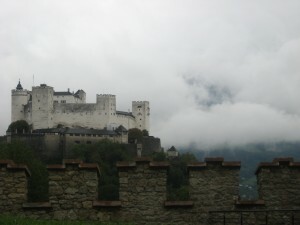 And when we once again find ourselves on the sidewalk in the middle of the city staring up at the massive Salzburg fortress, I hope it feels like coming home. The family came to town last weekend! I picked them up at the Salzburg train station around 1 on Saturday with bus tickets and chocolate bars in hand, and they somehow managed to remain enthusiastic about seeing Salzburg despite the jet lag and the crowded train ride from Munich. Kebaps for lunch revived them a bit and then we trekked down the road to my dorm so that they could see the bad spring break hotel that I’ve been living in for two months and meet Rachelle. 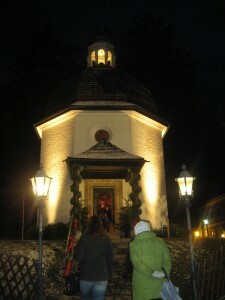 We took them into the Cathedral and walked past Mozart’s house. Then we all wandered around the recently opened Christmas markets for a little while before sleepiness got the best of the family, and I had to send them off to their hotel to recover from jet lag. Sunday we wanted to go out into the mountains but then realized we’d missed the only bus of the day out to the hiking trails by about a half an hour. Oh darn. 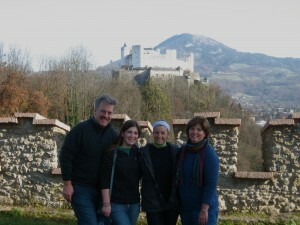 We settled instead for climbing up the fortress hill here in town and looking down over Salzburg from up there. We ate lunch at a beer hall on the hill, and then I let the three of them go into the fortress on their own so that I could get some homework done. That night we took the bus out to Hellbrunn Palace to see one of Salzburg’s other Christmas markets (and because I’d been told that there would be live reindeer at this one) and oohed and ahhed at the twinkly lights and the decorated trees. There was lots of good stuff to be purchased, but alas no reindeer to be seen. Disappointment. On our way back to their hotel that night we got stuck in epic traffic as 20th Century Fox had so considerately blocked off some of the major roads in Salzburg to film their silly movie. Tom Cruise and Cameron Diaz came to town to film Knight and Day, which apparently involves people jumping off of roofs and having car chases down narrow streets. Oh, and a helicopter of some sort. And, as if the traffic weren’t bad enough, now we’re all going to need to go see the darn thing when it comes out in July just because we’re going to want to see Salzburg make her cameo appearance. And someone in our group got Tom Cruise to sign his forehead. Monday we wandered around Salzburg some more, giving my sister plenty of time to accumulate lots of strange stuff at the Christmas markets. Late in the afternoon they tagged along with me and Rachelle to our weekly grocery shopping excursion and proceeded to buy lots of random Austrian goodies. My sister then ordered a hamburger at dinner that night. Fail. On Tuesday, their final day in the city, we shopped some more (the Christmas markets are endless mazes) and ate lunch at a little out of the way cafe in order to escape the rain. Kirsten, Rachel, and Rachelle joined us in hiking up the Kapuziner Berg that morning, a feat that we had yet to accomplish in Salzburg and which involved quite a lot of steps. But the views were quite awesome. I had to run away to take a test for our Austrian Culture class, but we said our goodbyes later that night over pizza at a little restaurant near their hotel. They left on a 6:45 train to Munich the next morning. Their trip went so fast, but I’m glad they all could come so that they’re not relying on pictures alone to imagine we’re I’ve been living all fall. It’s a city worth seeing, and one I’m going to have a very hard time saying goodbye to when I leave in less than three weeks. That’s right, less than three weeks. I still have so much to see and do and papers to write and things to buy and foods to try. But somehow it will all get done. I think. I had fried dough and sauerkraut for dinner at the Christmas market on Wednesday (Austria will clog your arteries) before we went ice skating one more time on, and this time more of the girls came with us so that we had quite a group. My friend Kenza bonded with an adorable Austrian little girl who then kept following us around and holding her hand. Too much cuteness. We had a lot of fun, and I somehow managed not to fall even once. Thursday was Thanksgiving, though it was hard to notice over here. Some kids were pretty upset about not being home for the holiday, but it was interesting to try and take the Austrian point of view and see it as any other Thursday in November. Some of us went to the weekly farmers’ market in the morning and marveled at the endless amounts of cheese and breads and meat. I have determined I’m going to need to live in a city with markets. They make life much more fun. That night, after an afternoon session of paper writing, we did get some semblance of holidayness when we all got dressed up to go to dinner. It wasn’t turkey and mashed potatoes, but it was a good meal at the oldest restaurant in central Europe, as well as performances of various numbers from Mozart’s operas. The restaurant was beautiful, and it was nice to be there as one big group to help ward off the homesickness some people were feeling. Dinner didn’t wind down until about 11 at night, and yet 21 out of the 36 of us were up and ready to drive to Innsbruck at 6:30 this morning. We drove down through the Alps in the dark, arriving in the still sleepy town of Rattenberg while the frost still clung to the grass and the sun wasn’t high enough to melt the fog off of the mountains. In typical Andreas style, we hiked our way up a hill to see a fortress that it turns out we couldn’t get into anyway. But the views were good, and the hike kept us from freezing in the early morning mountains so no one complained too loudly. After our stop over we got to Innsbruck about a half our later. Two time home of the Winter Olympics, Innsbruck is much further into the mountains than Salzburg, and the peaks looked almost fake in all of their snow capped hugeness. We stopped for strudel at a little bakery (sour cherry and cinnamon-yum!) before going on a tour of the city with Andreas. The Christmas markets are all set up in Innsbruck as well, so the whole city smelled like Austrian Christmas- sauerkraut, chestnuts, and cinnamon. Innsbruck is rather like Salzburg in that many of its streets are winding and narrow, and the buildings themselves old and smashed together at strange angles. 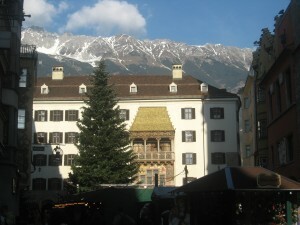 But Innsbruck has giants built into their streets and a Fairy Tale passage featuring statues of dozens of different fairy tales. We had fun trying to decipher the stories we knew from the German titles. After the tour we had just enough time to catch lunch and do some souvenir shopping before it was back on the bus and off to the town of Hall, a little outside of Innsbruck. Hall was another typical Austrian town, complete with Christmas decorations and church spires. Had Andreas had his way we would have made multiple stops after Hall, but we all insisted that sheer exhaustion was putting a damper on the touring, and so we all piled back on the bus for the last leg of our last AIFS excursion of the semester. We had a Sound of Music singalong before curling up as best we could in our seats and falling asleep on the 2.5 hour drive back to Salzburg. Tonight we’re tired, there’s a party of Spanish speakers going on outside our door, and I’m wishing I had maybe done some homework instead of mess with blog entries and photo updates. But what’s done is done. Tomorrow we’re getting together with the girls at Frau Shoettke’s to ring in the Christmas season by improvising Christmas cookies as best we can with the measuring utensils and ingredients we could muster up. Should be fun, and hopefully the results will be edible. Sunday is a ‘real football’ face-off between Salzburg and Vienna, so we’re going to try and be there to cheer on our Red Bulls. So much to see and do, so little time! For better or worse, we’re on the home stretch. We had a speaking exam on Thursday and a written test on Friday, and so German tests marked the end of week two in Salzburg. The exams meant the end of our intensive German class and the start of a fun-filled homework free weekend. Salzburg celebrated St. Rupert’s Day on the 23rd (I think? ), and they filled a section of the Old City with a festival to mark the occasion. 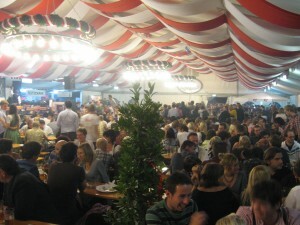 The fair, because it also serves as a sort of Salzburg Oktoberfest, ran for a few days after the official holiday. This gave us more than enough time, as in every night this weekend, to see everything there was to see: several carnival rides and games, lots of food stands selling everything from gingerbread to sausages, booths selling hand made crafts, toys, clothes (we all really want to buy lederhosen/dirndls now) and of course the huge beer tent. Even for someone who doesn’t like beer (I was just happy I finally found a place with sauerkraut), this tent still managed to serve as the ultimate in entertainment. A live band played traditional march music, drinking songs, and the occasional chorus of some random American pop song like “I Will Survive.” Several hundred people drinking beer out of mugs the size of my head accompanied them whenever the occasion arose. For some reason the urge to stand on benches and tables accompanied the need to belt out a tune, increasing the danger that this person may at any moment slosh beer onto anyone unfortunate enough to be sitting within a four foot radius. Somehow, I avoided just such a shower. I did not, however, and nor did just about anyone, avoid the amusing but creepy advances of the many drunken characters sure to make an appearance during any visit to the tent lasting more than 45 seconds. The first night they came in the form of older Austrian men intent on trying to speak English to us (I’m fairly sure they still think we’re all from California) and kissing us all on the cheeks as they left. Saturday night brought to our table a crowd of guys from Germany celebrating the impending wedding of one of their own. They were the loudest in the tent at times, but we learned some new songs while standing on benches and singing with them. When a few of them decided standing on the table was a good plan, I was relieved to discover it somehow held their weight. Around dinner time on Sunday night we joined some friends who had camped out in the tent all day. The combination of their lengthy stay and the amount of alcohol consumed meant some friends had been made, most notably a middle aged Russian/German man intent on creeping us all the heck out. This often involved one of those gummy hand things sometimes found in little kids’ quarter machines. He left after a little while though, only to be replaced by an Austrian teenager whose parents should obviously lower/eliminate his beer allowance. He’d gotten into just about everyones’ faces, male and female alike, and caused several stories of fake husbands/boyfriends to be concocted before we made a break for it and said good riddance to the beer tent. After our escape, some friends and I ran into an Australian couple who had been on the road around Europe for almost three months and had plenty of stories to tell, so we chatted with them for a bit before they informed us of the impending end-of-festival fireworks to be set off over the fortress. We stuck around to see them, and it was well worth it. Not even the momentary fear that some silly fireworks could end up burning down a 1000 year old structure could wreck the show. But I didn’t spend the whole weekend squished on a wooden bench singing “Ein Prosit” every fifteen minutes. Saturday some friends and I decided to venture out into Austria’s lake district, which is in another Austrian state but only about an hour bus ride away. How this came to be the plan is a long and convoluted story beginning with a quest to get to Neuschwanstein Castle in Bavaria and ending with my holding an all-in-German conversation with an employee at the train station about the hows, whens, and how muchs involved in getting to the little town of Mondsee. As it turns out, its super easy. 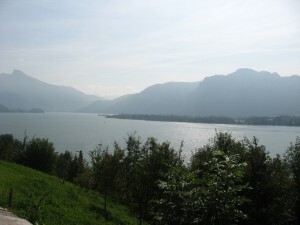 We got up early Saturday and caught an 11 Euro bus at 8:40 that took us through several smaller towns until we got to Mondsee, which translates literally to Moon Lake because of its large, crescent shaped lake of the same name. We didn’t have a whole lot by way of plans for seeing and doing in the town, so we wandered a lot and ate our way through many of tiny Mondsee’s eating establishments. Mondsee is home to a church they used in filming The Sound of Music, so we went in and around there and then explored the waterfront. Rachelle and I had brought swimsuits with the hope of possibly getting into the water, but, and much to the guys’ amusement, the weather and the lake temperature did not cooperate with such plans. We did have some gorgeous views of the mountains around the lake though. Not quite content with that, we climbed a steep hill to another church so as to see the lake from a higher altitude. By that point in the afternoon the fog had cleared, and the scenes were so pretty that the five of us were ready to pool the Euros in our wallets and buy a house on the hill overlooking the town. We ran out of places to wander shortly thereafter, and we caught a bus that had us back into Salzburg by dinner time. Sunday, after I (oops) slept through the alarm meant to wake me up in time to get to church to watch Rachelle sing in the cathedral choir, some of us became tourists in our own town and climbed yet another impossibly steep hill up to Festung Hohensalzburg, the fortress that looks down over the entire city. The fortress is one of the largest of its kind in Europe, and at no point during its hundreds of years in use was it taken by force. We’re pretty sure this is because the need to climb an epic mountain before even getting to the walls of the fortress itself would have deterred any potential invaders. 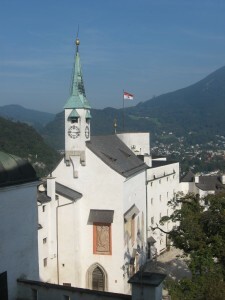 We took a short tour of the interior of the castle and shot some pictures of the whole of Salzburg from its tower. We also listened to the beer drinkers singing from the tent at the bottom of the hill. That’s how loud they were. The fortress has some museums and things as well, mostly of military history items, that we skimmed through, and before we knew it our afternoon, and most of our weekend had vanished. Lots of people have classes starting tomorrow, but I’m lucky enough to have one more day to sleep in and hang around because the class I’ll normally have Monday and Wednesday is not starting until Wednesday. On the list for this week: more grocery shopping, searching for cheap places to buy dirndls in Munich so we can get one while we’re there next weekend, and finalizing plans for the many other weekend trips we want to make this semester. And maybe some homework. 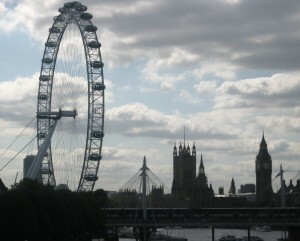 Somehow it just doesn’t seem real that I was getting on a plane to London only a week ago today. I feel like I’ve been away from home for months. In a good way. We’ve crammed so much into such a short amount of time. My first weekend abroad was spent exploring London and getting to know the group of fun people I’m going to be in Salzburg with for the next three months. Jet lag attempted to hold us back, but most of us managed to stay sufficiently awake to avoid getting hit by those always unexpected other-side-of-the-road drivers. We fought The Tired long enough to see some of London’s major touristy spots even while still managing to sneak in a bit of a very much needed afternoon nap. In our free time some of us decided to tour Buckingham Palace as it’s only open to the public through the end of this month. After having seen so many castles long since devoted to tourism, it was a bit strange to walk through the hallways and know that, no matter how glitzy it was, people still lived there. Though I do have to say, the Queen’s backyard was a bit disappointing. It was a large field. I feel as though flowers and hedgerows should have been involved. Our time in London came to an end far too early in the morning on Sunday. We got up in time to leave our hotel at 5:15 AM. For most us of this meant we were traveling on about ten hours of sleep spread over two or three days. Lack of sleep made the news we got upon getting to the airport, that our luggage van had broken down somewhere along the side of a suburban London highway, all the more depressing. So we sat on the floor of the airport and guzzled coffee. For hours. Finally we greeted the arrival of our rescued suitcases with more enthusiasm than any of London’s sites had gotten out of us. We made our flight with only a little time to spare, and my sleepiness induced crankiness was eased somewhat by the even more exhausting tale of my German seatmate, a girl who had come all the way from Costa Rica via Miami and was finally making her way home to Germany after more than a day of traveling. She still had enough energy to chat, so she told me about Salzburg, and her school, and whether I would understand anything the Austrians said, because “they don’t speak real German.” When we finally got to Munich we had changed time zones yet again, but all of us piled onto a bus that would take us to Salzburg and our home for the next few months. It was on the bus that we found out for the first time where and with whom we would be living. 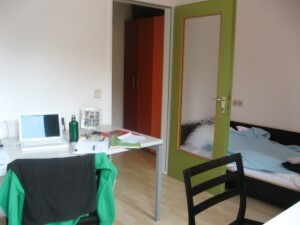 Turns out my dorm resembles a bit of an Ikea ad. It’s a whole lot different from the red brick, white columned buildings at Mary Washington, but it will do for now. My roommate, Rachelle, is from California, and we’ve been having a grand time laughing as we figure out what to make of the ridiculous situations we put ourselves in. Our shower is a death trap, our kitchen is inside a closet, and we can’t turn the fan in the bathroom off even if we wanted to. But it’s fun. And I’m loving it. We’ve bonded with the other Americans in the building, and it seems that just today there are Austrian students moving in, so soon enough the dorm will be a interesting mix of people and languages and customs. We had orientation for the first few days that we were here. We learned how to use the bus system, how to find our classes, and spent a few entertaining hours emptying out several stores of their cheapest cell phones. Virtually everyone in the program now has the exact same phone, and how we’re going to tell them apart if we should ever put them down together I have no idea. Our orientation tour of the city showed us how lucky we are to be living in a town that goes back thousands of years. Our overly enthusiastic guide informed us we would be trekking up mountains, girls in flip flops and all, and though we mumbled a bit about the rain and the cold and the endless walking, the views from the hills were stunning. Every time you turn a corner in this city you’re greeted with a new view even more dramatic than the last. Having a fortress on the hill is still something I’m getting used to. We spent our free time scouting out the cheap yet tasty restaurants, buying bus passes, and figuring out how to get by speaking an awkward combination of German and English. Germish, if you will. Rachelle and I had our first real culture shock experience when we attempted to go grocery shopping. We had been warned that we would have to bag our own groceries. We were prepared for this. We muddled our way through shopping, which is time consuming when you have to guess at what a lot of the items are, and worked up the courage to go up to the register. I have never seen a person scan groceries as quickly as the woman at the check out counter did. As she’s scanning them she’s practically throwing them at us, even though Rachelle is throwing things in our bag as quickly as she can. It was stressful. And afterwards highly amusing. And now we know that we just have to push everything into the cart until after we pay; once that’s done we can walk calmly over to the “bagging area” to organize things and recover from the trauma of watching your groceries moving at the speed of sound. It’s the strange little things like that that keep making me realize we really aren’t at home anymore. We started intensive German classes this week, and they run through the end of next week. We don’t start our real academic classes until almost October. Three hours a day of grammar is a bit much, but I do know far more of the language than I realized. I’ve started working up the courage to speak German to the Austrians, though they don’t do much for a person’s confidence when they instantly switch to English. All in all though, the Austrians we’ve spoken to have been amazingly friendly despite their reputation as being standoffish. We’ve gotten tips on everything from which train to take to Oktoberfest, to which spicy peppers to avoid eating in our Indian food, to which bus stop to get off at when we’ve looked lost and confused. Some of us had a highly amusing time of it attempting to communicate with a group of older Swiss men at a restuarant, but somehow between our broken German and their handful of English phrases we got quite a bit said. But I feel like something got lost in translation the other day when someone asked me if I was Amish upon finding out I was from Pennsylvania. I’m starting to feel like I know my way around a bit more, and it’s fun planning our future weekend excursions. We don’t have classes on Fridays so three day travel weekends here we come. Italy! Slovenia! Croatia! Czech Republic! Plans to see them all! Stay tuned.